Austria was, for many centuries, the heart of Habsburg Empire. This was a large multi-ethnic empire covered that include not only Austria itself, but also stretched across many other neighboring countries, including Hungary, parts of Germany, parts of Italy, what is today the Czech Republic. and stretched into the Balkans. The empire endured for hundreds of years, and only finally collapsed in 1918, at the end of World War I. As a result of this history, many German (especially Bavarian), Hungarian, Italian, eastern European and Jewish influences can all be still seen in modern Austrian cuisine. As far as people from overseas are concerned, the most famous aspect of Austrian cuisine is probably the country's desserts, cakes and pastries. Austria's capital, Vienna, in particular is extremely famous in this regard. However, although there are indeed many excellent Austrian desserts, you should not neglect the fact that Austrian cuisine has much else to offer as well. Goulash - Goulash is a type of beef stew (actually prepared as a soup but its very thick) that has its origins in Hungarian cuisine. Austria has of course adopted the dish too, and Austrian have adapted it to local tastes. Goulash is made from beef, onions and red peppers, and flavored with paprika. Knödel - Knödel are traditional Austrian dumplings which may be eaten as a side dish or used in soups. There are quite a few different varieties, including ones made from potato (kartoffelknödel), from dry bread (semmelknödel), or made with the addition of bacon (speckknödel). Tafelspitz - Beef and root vegetables boiled together. Wiener schnitzel - Translated literally from the German, "Wiener schnitzel" means "Viennese cutlet". This dish is made by dipping thin slices of meat in a wheat flour, eggs and bread crumbs, and then deep-frying. Veal is traditionally used, but other meats may be substituted, and the use of pork or even turkey is quite common nowadays. Wiener schnitzel is traditionally served with potato salad and a slice of lemon. Apfel strudel - In English "Apple studel" - a pastry filled with apples, sugar and raisins. Rum or cinnamon are sometimes added to the filling to add to the flavor. 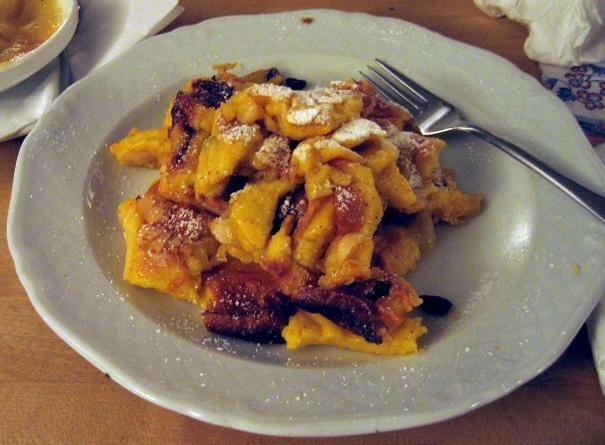 Kaiserschmarrn - Pancakes, topped with raisins and powdered sugar, and served with fruit compotes. Linzertorte - This is a distinctive tart made out of crumbly pastry that contains butter and ground nuts (usually almonds). The tart is filled plum butter or with jam, and is highly recognizable because of its distinctive design. Linzertorte is topped with lattice design made strips of pastry, and is usually also decorated with almonds. The dish is named for the city of Linz in Austria, where the recipe is believed originated during the 17th century. 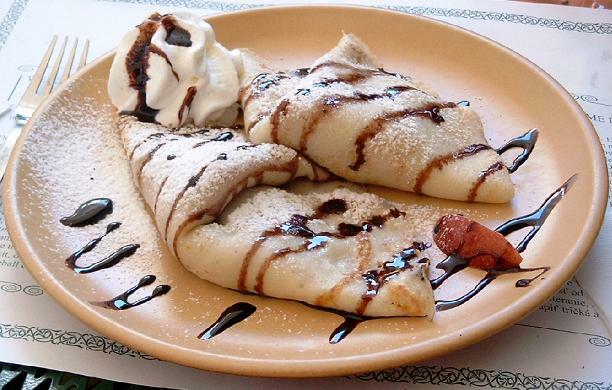 Palatschinken - Thin pancakes, traditionally filled with apricot jam and sprinked with sugar, although sometimes other fillings may be used. Sachertorte - Chocolate cake with dark chocolate icing with a layer of apricot jam in the middle. Vanillekipferl - A traditional biscuit from Vienna. The biscuit is made using ground almonds or hazelnuts and flavored with vanilla. The biscuits are crescent-shaped, the origin of this, according to legend, being to celebrate one of the Habsburg's military victories against the Turks.